- Research how much other engravers are charging for the type of work you wish to pursue. Determine how your work compares to theirs. If Joe Blow is charging $50 to engrave a monogram or $500 to engrave a knife, and your work is not as good as Joe's, then you should charge less than Joe. - Determine the supply and demand for local engraving services. If Joe is booked solid or not taking new accounts, then perhaps you can charge a bit more if customers are in need of an engraver. This would most likely apply to jewelry stores. Be careful, though. High demand is not license to charge more than your work is worth. - Are you the only engraver in town? 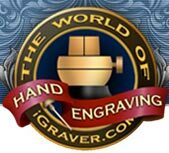 Since there are no other local engravers, you will be free to establish prices. A word of caution: Be sensible and honest about what you can deliver for the price you're charging. If a customer feels the quality isn't worth the price they're paying, then expect them to seek another engraver and do business by mail if they have to. Having someone locally who can deliver quality work at a fair price and in a timely fashion can be a dream-come-true for stores that do a lot of engraving business, especially during the holidays. - Forget all of the above, determine how much money you need to make per hour, and price accordingly. I'd advise you to be very careful taking this approach, especially in the beginning. If your work isn't worth what you charge per hour, then you will be starting off on the wrong foot. The same rules apply, but on a national level as opposed to local-only work. You must research how much other engravers are charging, determine how your work stacks up quality-wise, and charge accordingly. The rule of supply & demand can also influence prices, but another word of caution: It's easy to raise prices, but can be devastating if you are forced to lower them. If John Doe paid you $1500 to engrave a knife and then you drop the price to $1000 for the same job in order to get work when the demand slacks, you and your reputation are in big trouble, and Mr. Doe is unlikely to commision your work again, since it was you who devalued it. - Expect to charge less in the beginning and gradually raise prices as the quality of your work and the demand for it increases. - Give discounts and customers will expect discounts forever. Consider the consequences and be prepared for what lies ahead if you choose to give discounts. - If you're doing engraving for jewelry stores, then wholesale pricing is the norm. Expect jewelry stores to mark up your engraving 100%. Surprised at the markup? Wake up and smell the keystoning. If you’re not familiar with that term, keystoning is a 100% to 300% markup done by jewelry stores. - Keep all options open. If your primary interest is gun or knife engraving that's fine, but don't overlook jewelry engraving. Quite often more money can be made per hour engraving jewelry than a $10,000 gun or knife job. Not all jewelry engraving is the low-end stuff we see so much of. Relief engraving, intaglio coats-of-arms, and fine lettering on jewelry will broaden your horizons, make you a better engraver, and put money in your pocket. - Expect to see peaks and valleys in your engraving business, just like any other business. In the past, for example, collectors have driven the prices of engraved knives sky high, then suddenly disappear when trends change, leaving dealers, knifemakers, and engravers hurting. When the demand is out the roof, it's tempting to get caught up in the frenzy and charge a lot more than you normally would. When the party is over, you can be left with prices collectors are unwilling to pay. Lowering prices causes even more problems. The moral of the story is to keep a level head, charge what's fair, and expect that what's hot now might not be hot in a few months. It's not a question of if, but a question of when. Incidentally, collectors have done similar things with gems and other collectibles, not just engraved knives. - Live by a fair price for all policy. Charging a customer more simply because he’s wealthy and can afford it is among the worst mistakes you can make. This has happened in the world of high end custom knives, and has ruined relationships between collectors and the knifemakers and engravers who do work for them. Sooner or later they catch on that they’ve been taken advantage of, and then are suspicious of everyone. Would you buy again from a store that intentionally overcharged you?